How to make trendy t-shirts using iron-on vinyl and the Cricut. Wear your favorite movie quotes or design from scratch. An easy DIY craft tutorial idea. Products used were given by Cricut, but all opinions expressed are 100% my own. Have you noticed that T-shirts can be so creative, hilarious and even sometimes even true? I love the t-shirt trend that is going on right now and there are so many great ones out there. I was tickled pink when Cricut asked me to participate in a T-shirt Design Contest. That meant I got to do a couple of my very favorite things, create a tutorial for you, make something super cute and then I get to wear it! I actually designed a total of 7 trendy t-shirts but narrowed it down because some were better than other. I then put a shout on social media and asked for votes on which one was their favorite. Number one is very niche and because of my occupation, it was one of my favorites but didn’t get any votes. Two and three were super close with only one vote apart. The sad thing for me is number 4 got ZERO points! OK, seriously people?! This is hilarious but only if you know the whole movie quote. Maybe that’s why it’s not funny. It’s okay, I’m still standing by the fact that I’m hilarious. I took the trendy t-shirt design with the most votes and used that to create the tutorial today. Click through to the next page for the stepped-out tutorial. 100 pts to you Stephanie!! Thanks for the reminder! I have had a design in my head for a couple of years for a t-shirt. I would love to see it when it is finished Jonni! I’ve always wondered how people did this! I just recently (like 2 weeks ago) discovered that there is iron on vinyl! I have an old circuit…from 5 years ago…but I think it would still work? I really want to try this, but am so afraid of messing it up…although what do I really have to lose? Thanks for the great tutorial! You make me thing I can do it! You totally can Sarah! You’ll be hooked! You make this look easy so now I’m not intimidated to give it a try. Thank you! Thank you Erin! I would love to see what you create! The design is super cute! 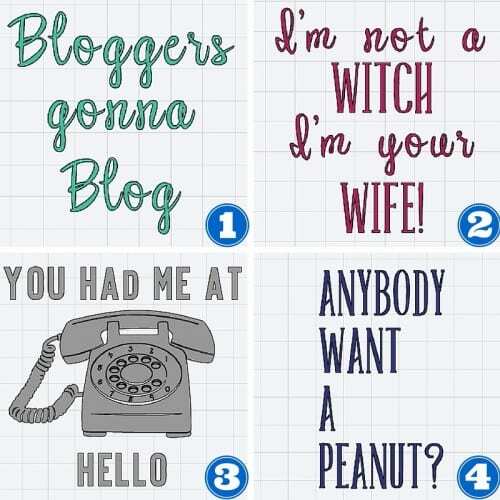 I love the bloggers gonna blog! I actually have 2 Cricuts and haven’t had any time to play with them. You have defiantly inspired me to wipe the dust off and crafting! Pinning! Thank you for link up at Funtastic Friday! Thank you Lacie! You totally should get creating with your Cricuts. They are so muhc fun! These look fabulous and they are individual so they are perfectly unique. Great idea! I love your shirts they turned out cute. I have been wanting a Cricut for a long time. I might just have to get one now!! Thank you so much, Kim! Making shirts really is addictive and I have made quite a few over the last little bit. Great tutorial! I couldn’t find the Trendy t-shirt cartridge anywhere. Can you help? Once you are in Cricut Design Space, click on file and new. On the left-hand menu bar click on insert images.Then click on cartridges, type trendy in the search bar, and then the images will be right there. I hope that helps! Great tutorial, and awesome work. How does this hold up after being washed? Really want to try this, just nervous about how well it will stay! Hi Beth! It holds up pretty well. I still wear all of the shirts and it is almost a year later. Washing the clothing inside is helpful but also making sure it is good and stuck when applying. IF there are any edges that aren’t stuck down good, that is where it will start to peel up. What kind of Circuit did you use for this? I’m considering investing in one for simple shirt making like this. I did these shirts with the Cricut Explore. I love my Cricut!